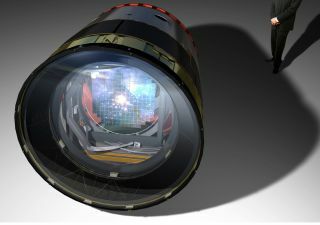 An artist's rendering of the Large Synoptic Survey Telescope's camera, with a man standing behind it to show its size. Plans for an enormous telescope, equipped with a 3.2 billion-pixel camera, are ready for detailed designs, its creators announced today (April 24). When built, the Large Synoptic Survey Telescope will take photos of every inch of visible night sky every week for 10 years in a kind of time-lapse picture that will provide scientists with unparalleled views of the universe. The telescope's research team, which received Critical Decision 1 approval from the U.S. Department of Energy, will now begin to make in-depth designs, a schedule and a budget. Department of Energy projects go through five critical decision stages, according to a department document posted online. The telescope, known as LSST, is a long-planned and long-anticipated project, originally conceived in 1998. "It is tremendously satisfying to finally see this move forward to the point when we can begin to carry out the project," a LSST project director, Steven Kahn, of the SLAC National Accelerometer Laboratory in Menlo Park, Calif., said in a statement. The LSST will gather 6 million gigabytes of data annually, and its detailed images will teach astronomers more about dark energy, dark matter, near-Earth asteroids and the Kuiper belt, a region just beyond Neptune's orbit where Pluto and other icy objects carve their paths in space. It can also help researchers track asteroids that threaten Earth, according to the LSST's website. All the LSST's data will be publicly available, so "anyone with a computer will be able to fly through the Universe, zooming past objects a hundred million times fainter than can be observed with the unaided eye," the site says. Though the telescope was originally scheduled for completion this year, SLAC now says construction will start in 2014. Researchers have already started work on its 8.4-meter (27.6-foot) mirror and on preparing its construction site, atop the Cerro Pachón mountain in northern Chile.